Ben & Nino Towing and Auto Repair has earned a reputation for professionalism and quality customer service in Fort Greene, Brooklyn. Our fleet of tow trucks are operated by an experienced team, ready to assists you 24 hours a day, 7 days a week. We provide a wide range of roadside services so that our operators can get you moving. When a vehicle breaks down and needs repairs, the last thing you want is to abandon it. There’s something about leaving an automobile in a strange location that feels unsafe. The life of a car battery is a true mystery. But when they die, it can leave you in dire straits. Fortunately, we can get you up and running on the spot. It’s amazing how difficult tire changes have become. Whether overcoming difficult factory torque settings or rusted lug nuts, we’re happy to help you swap out a flat tire. Few things feel quite as embarrassing as locking the keys in your car. Yet, it happens to all of us. Rather than make a bunch of calls to friends and family to retrieve another set, we can swing by and open your door in a jiffy. Everyone runs out of gas at some point. Our drivers are more than happy to bring you fuel so that you can make it to the next station. 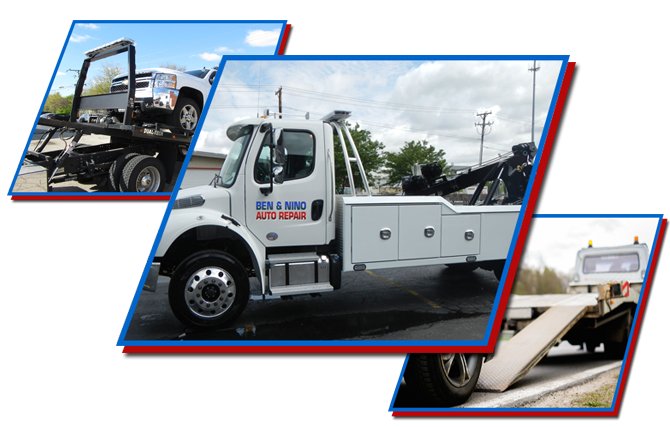 Ben & Nino Towing and Auto Repair has become a primary resource for roadside assistance and precision towing. We are here to assist people in the Fort Greene, Brooklyn, community 24/7. Call us at (718) 339-8500.